We are celebrating yet another birthday, but this one is being celebrated with breakfast and we are doing it a day early, due to the Thanksgiving holiday. When was the last time you thought about your breakfast? Not just your breakfast, but all breakfasts. Is there any meal (aside from maybe Thanksgiving Dinner) that is more dependent on bread products? Pancakes. Waffles. French toast. Muffins. Bagels. Scones. Cereal. Crepes. Biscuits. Donuts. Toast. English muffins. Croissants. Seems ridiculously tough when you have to be gluten-free. Seems overwhelming. When cooking at home, most of these things can be converted to gluten-free. Maybe a little trial-and-error is necessary, but my family doesn't seem to have any problem with my errors. But when eating out, it is a whole different ball game. I just look for other things I love. And I don't stare down the toast and muffins and pancakes that the others at the table get. I just don't let myself look. I look into the faces of the people who share my table. I study the cream swirling in my coffee. I savor a sip of orange juice. Don't stare down the pastries! Focus on other things. Things like bacon. What better breakfast meat is there? And I love cheese. This is a major failing for me. So, quite often, when eating out, I look for omelets. I know I love bacon and cheese, so now I'm completely comfortable asking for egg whites, instead of whole eggs. There's nothing wrong with whole eggs. I just want to save my fat for the bacon and cheese! And I don't miss the flavor of a whole egg for one nanosecond. Egg whites do me just dandy. And potatoes are nice, but I'm a bit picky. No potatoes from a fryer, due to probable cross-contamination. Maybe hash browns or home fries, but they need to be really well-done (but not burned) for me to like them. Really, I can do without morning potatoes. But they do handily replace those simple carbs of that pastry list above when needed. Fruit! I love getting fruit that I don't normally let myself buy for home. Pineapple! Strawberries! If I can get these fresh, I will happily stare them down before I chow down. Fresh berries are even better! Of course, there are other options usually available too, but these are just a few of the strategies I use. I don't think about them anymore. I just started thinking about it, in anticipation of going to a restaurant that doesn't have a gluten-free menu. Our birthday guest of honor selected breakfast at Eggspectation. We had never been there before, so this was the perfect opportunity to try it out. The menu is large and varied. They serve breakfast, lunch and dinner all day long. They claim their specialty is the Eggs Benedict. So, I explained that I can't have any wheat and then asked, "Does the hollandaise sauce have any wheat in it?" Our server disappeared to go ask. "No what? No wheat? No I can't have it?" "No wheat. I read the list of ingredients." Ah, good. But "list of ingredients"??? You mean it isn't being read from a recipe? I concluded that they probably weren't making their own hollandaise sauce in house. So, I changed my mind. Back to my planned omelet. 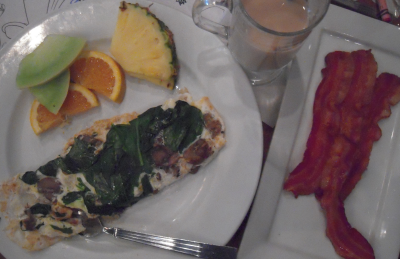 I chose spinach, mushrooms and swiss omelet, with a side of bacon. Hold the toast, please! It was good, but nothing outstanding. It was what I ordered, but not fabulous. It appears that it was entirely safe for me to eat. And I even got fresh pineapple off three of our plates! Taking votes around the table, everybody said that everything was good or okay, but nothing was fantastic. The prices were a bit on the high side, considering what we got. All in all, it was a successful and safe breakfast. But was it enough for a celebratory breakfast? Well... I'm not quite sure about that, unless you consider the prices.